As promised - article no. 2 from the Halloween series is delivered. Today we're talking: pumpkin carving and decorating ideas. 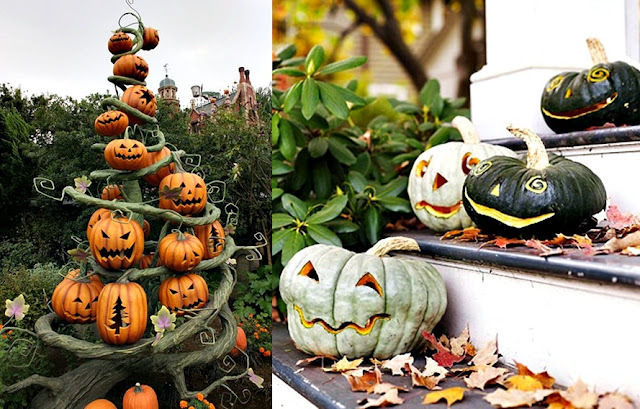 Pumpkins are both a fall staple and the greatest Halloween symbol there is. In fact I consider pumpkins essential for a great Halloween party. They come in different shapes, colors and flavors and can be used for delicious Halloween recipes and amazing decor. 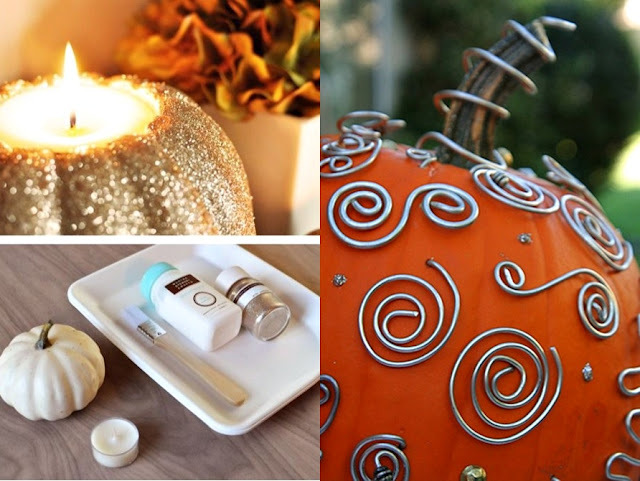 The best part is they are inexpensive and easy to find during autumn. 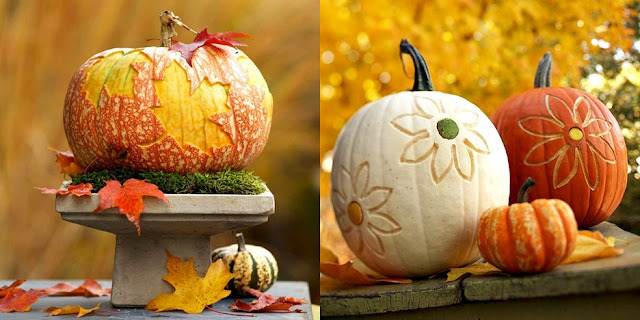 I collected some wonderful pumpkin carving and pumpkin decorating ideas for everybody to use. 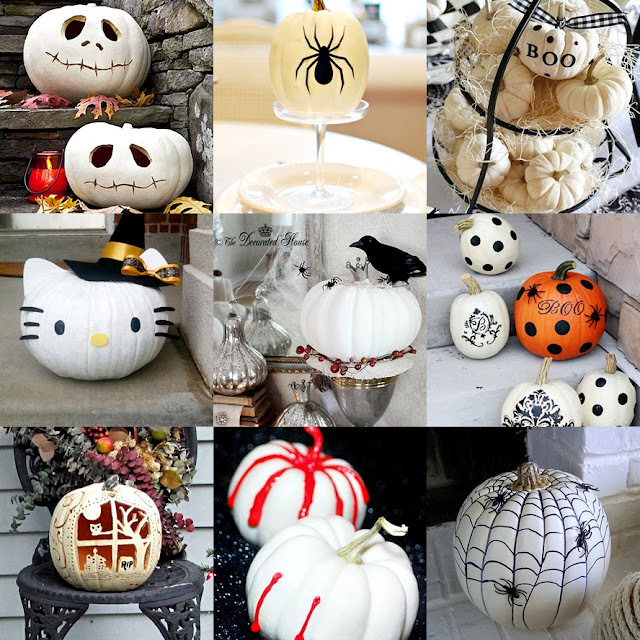 The only thing you need is as many pumpkins you can get your hands on because I made a lot of inspiring collages with all kinds of Halloween pumpkins for you to craft/DIY! Don't forget to also read my article about Halloween food - spooky desserts and treats! 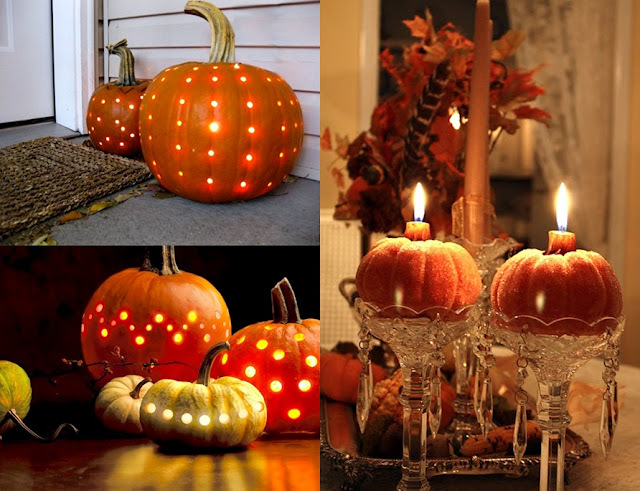 Use a drill to make a polka dotted carved pumpkin (left). 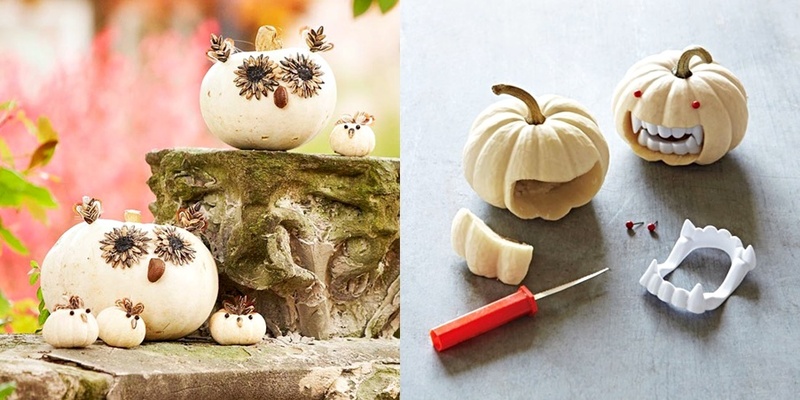 Mini pumpkins will look lovely as candles holders for the Halloween table! Classy white pumpkins (you can use white paint on classic orange pumpkins) with beautiful black stencils - you can find lots of free pumpkin stencils with a simple internet search. 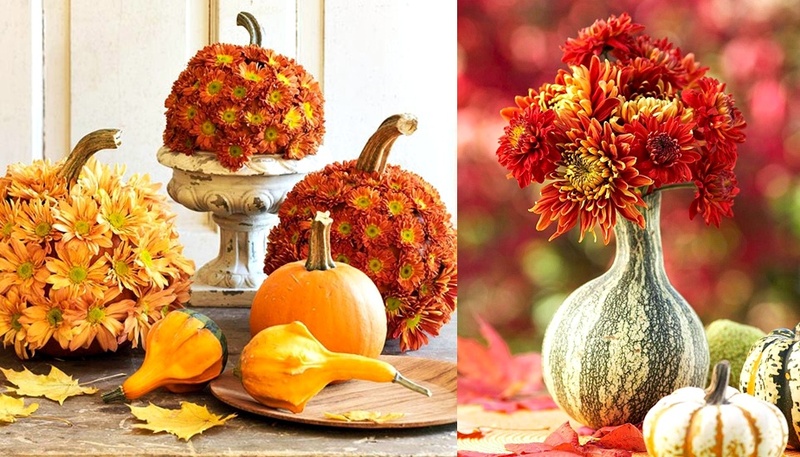 This is such a simple idea and looks incredible: flower covered pumpkins (left) and a cool shaped pumpkin used as a vase - a great centerpiece for autumn! Trick or Treat! 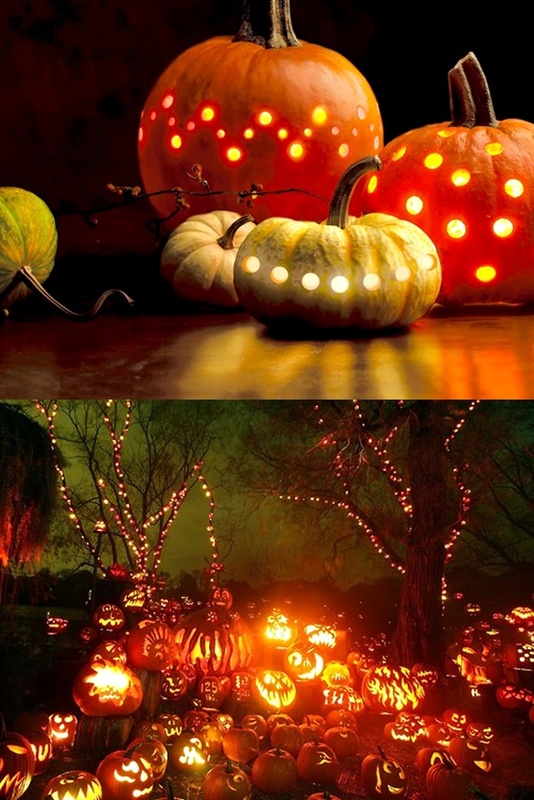 Scary lighted pumpkins! 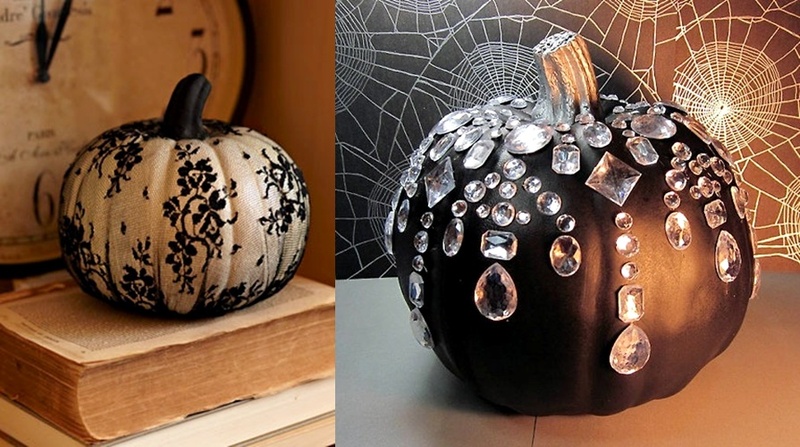 Halloween Decor - lace pumpkin in a stocking and bling/flashy black pumpkin decorated with crystals! Leaf-carved pumpkin (left). Simple flowers are a cute way to dress up pumpkins (right). 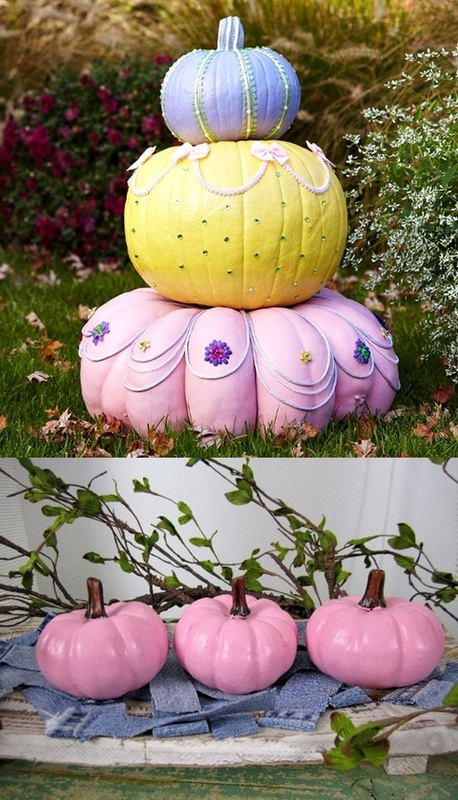 Fabulous Cinderella Pumpkins made with different size pumpkins colored in pink, yellow and purple and decorated with crystals, pearls, beads, flowers and fabric bows! So dreamy! Lovely crochet lace covered pumpkin (left) and pastel "tattooed" pumpkins decorated with beads (right). Scary Jack O-Lantern! The little pug is so cute!!! 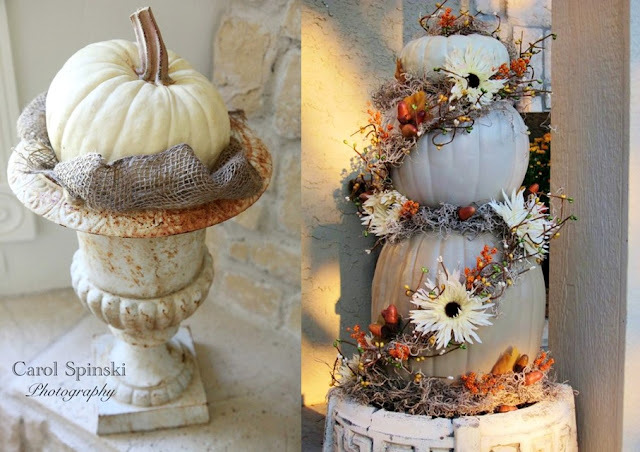 Pumpkin Topiary - use neutral colors with a splash of orange for an elegant look. 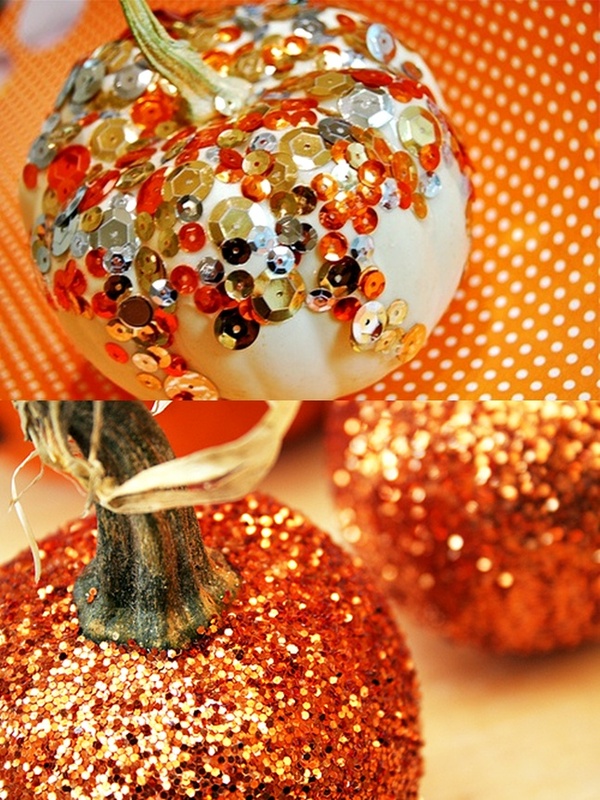 Sequined and glittered pumpkins (cover them in glue before adding sequins and/or glitter). 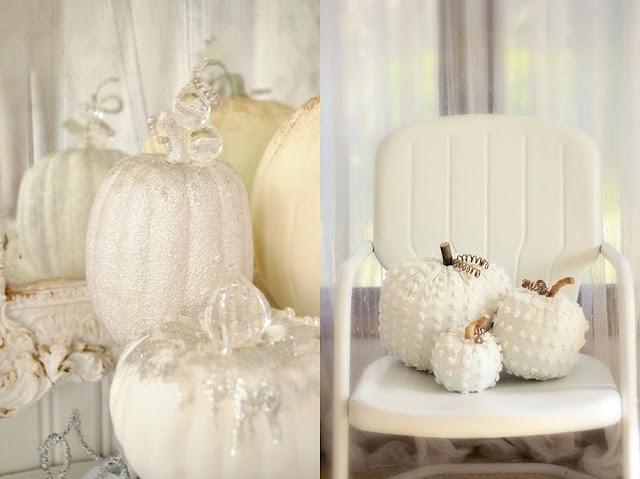 DIY pumpkin decorating using buttons, lace, veil, patterned fabric and sequins! 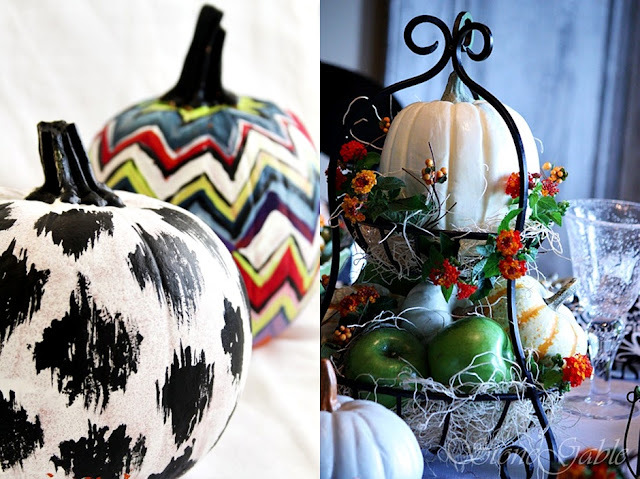 Painted pumpkins using white ones as a base (use pumpkin stencils and black paint on top of it)! Amazing cat pumpkin! 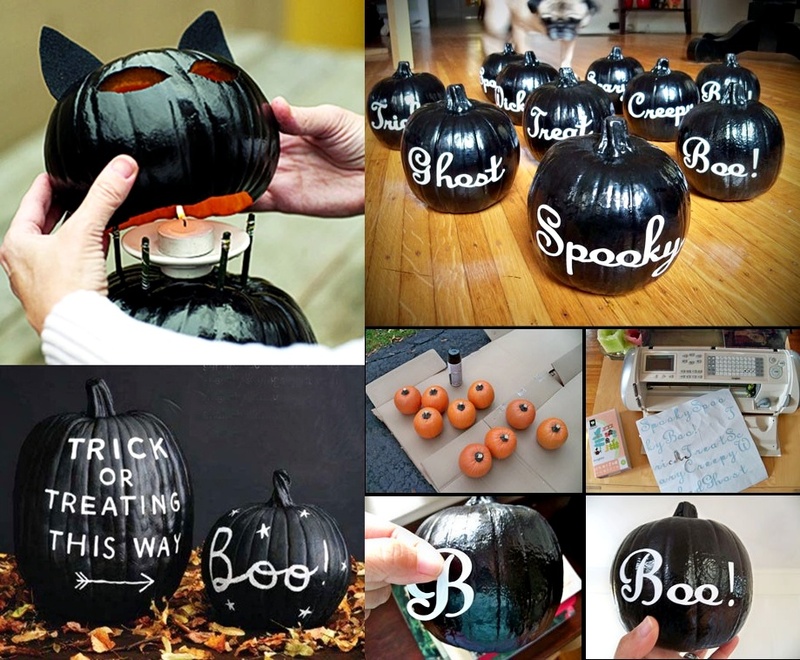 Black pumpkins with white stencil texts! Spooky pumpkin faces - employ your carving skills towards putting the fear if God into all the kids trick-or- treating! It's a worthy cause! 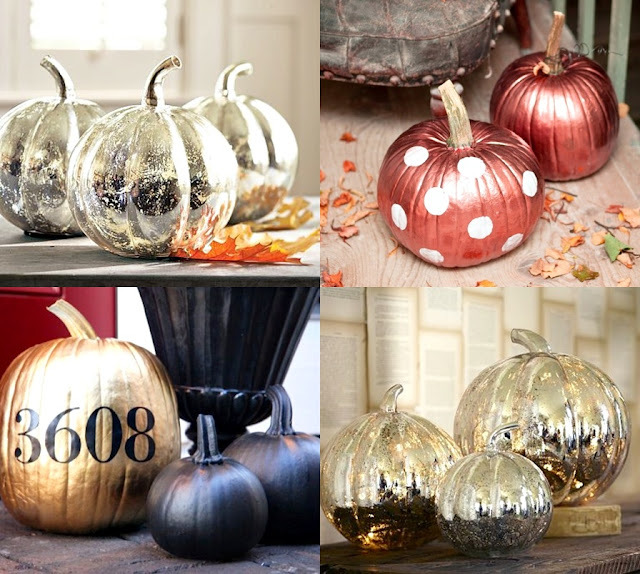 Metallic Halloween pumpkins (use 'Looking glass' spray or silver cooking sheets to transform pumpkins into these gorgeous centerpieces, I recommend a white spray first to get the best effect). 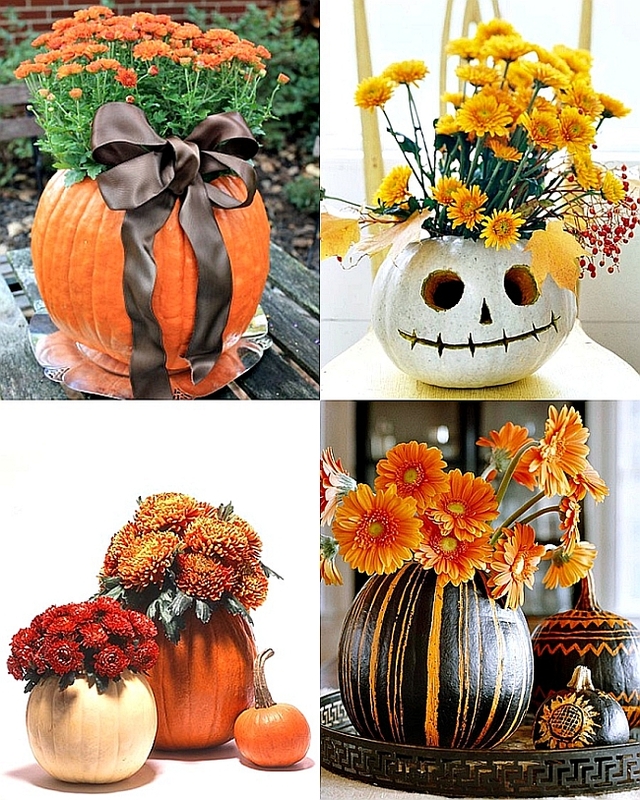 So beautiful - pumpkins used as vases, add yellow, red, orange fall flowers for an amazing Halloween centerpiece! 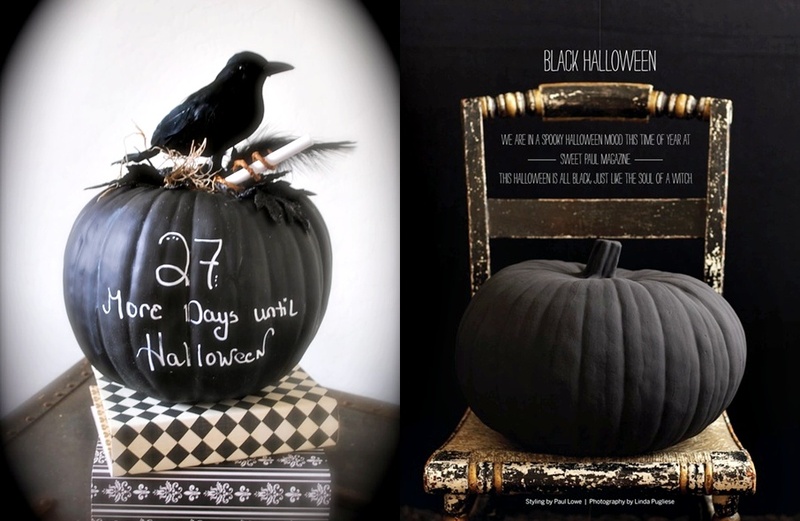 Black Halloween pumpkins - the stuffed crow on top is a nice touch and by nice I mean fabulously disturbing! 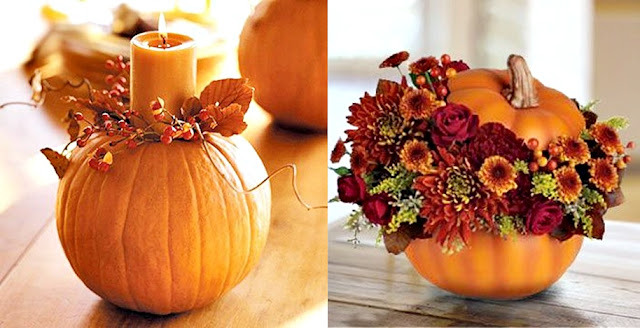 Pumpkin floral and candles arrangements to die for! Pumpkins toppers with fabric decorations. 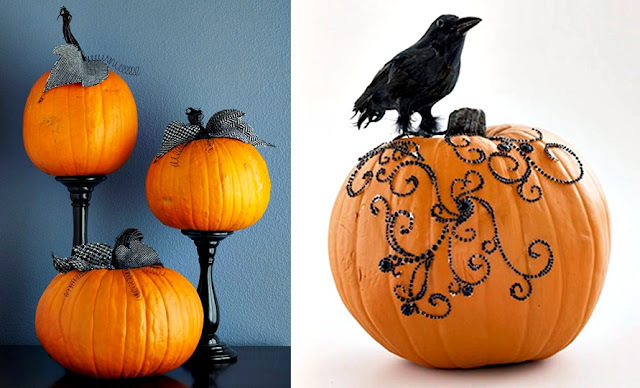 Sequins pumpkin - the stuffed crow really adds the creepy Halloween factor! 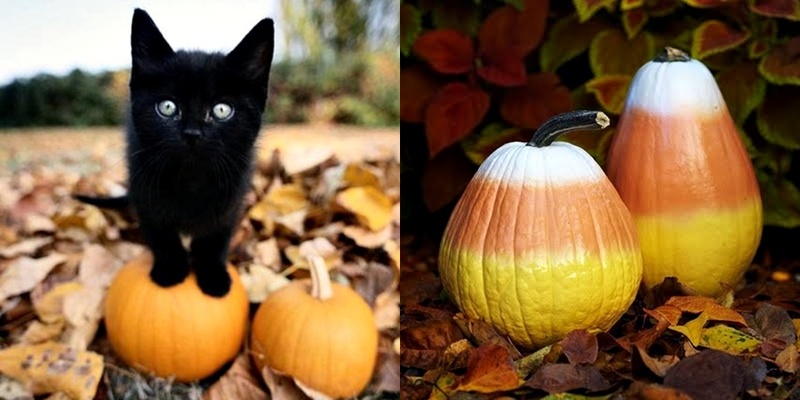 The tiny black cat is the cutest thing I have ever seen! I bet she would love some ombre candy corn pumpkins! Best idea ever: be original and use pumpkins as ice buckets for Halloween drinks! Fancy pumpkin patterns using beads, pearls and sequins! Almost as classy as the black and white painted pumpkins! 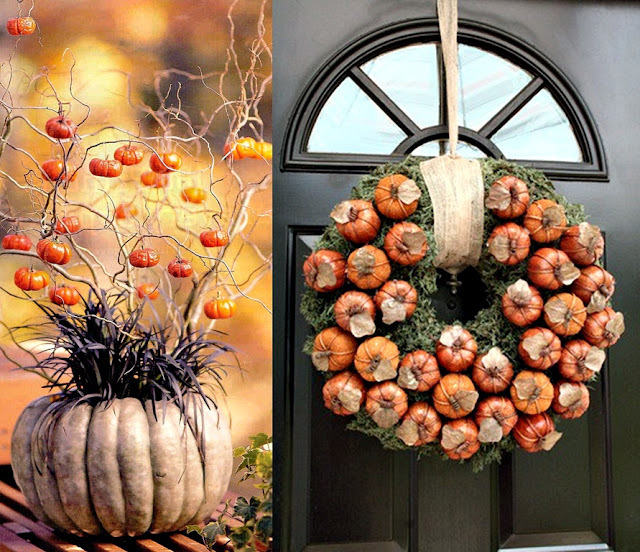 Halloween decor at its best: creepy tomatoes tree in a decaying pumpkin and mini pumpkins Halloween fall wreath to hang on your door. Aren't these Halloween pumpkins ideas just wonderful? I know I will try some of them! How about you? Which one/ones got your creative juices flowing? 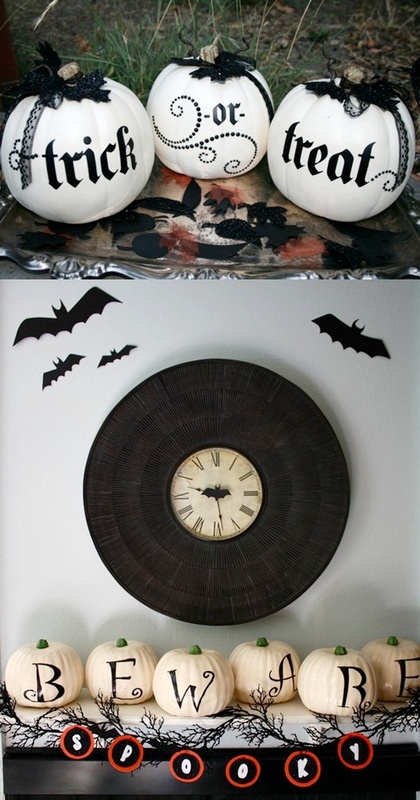 not really a fan of Halloween but this ideas look like fun. btw, i'm hosting a giveaway on my blog if you are interested. You can win a piece of jewelry. Wow that is absolutely amazing!!! Classy white pumkins are the best! wow amazing inspiration, I love the one with the birdcage!!! 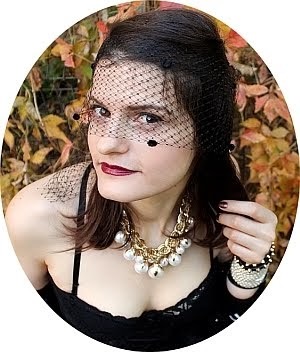 could you please help and vote me at DESIGUAL CONTEST? I love Your blog! 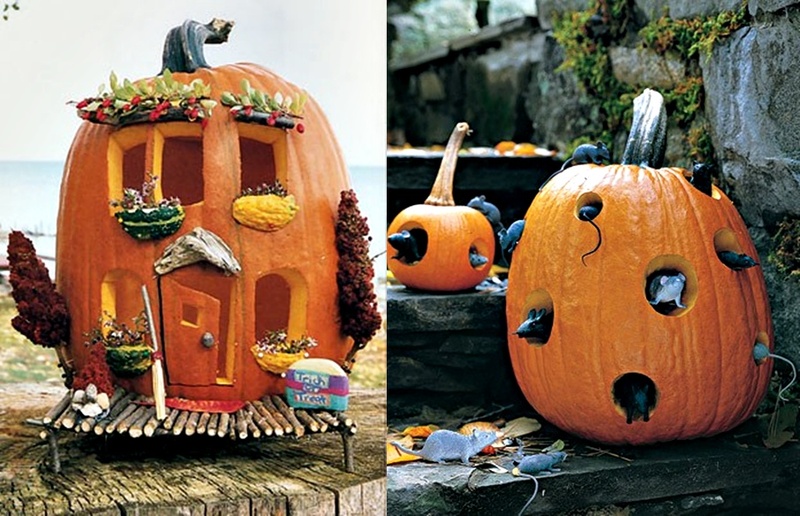 I always thought that decorating with pumpkins is boring! I only did their faces:) And i fall in love with black pumpkin with cristals! it's my favourite! love your post , wonderful ! So nice in black and white and the cats are so lovely! Also, the moustache is fantastic! Great ideas! This little puppy seems so scared! :) I'm glad that you like my hairstyle. Kisses! 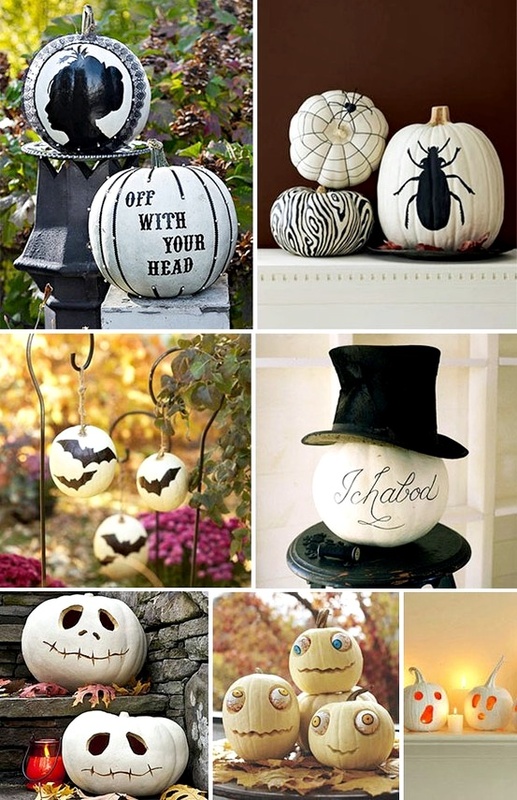 Those are wonderful decorating ideas!! I love the pumpkins with the rhinestones, cute ! OMG who said Pumpkin Carving had to be scary or boring. These are soooo cute! Lovely post! 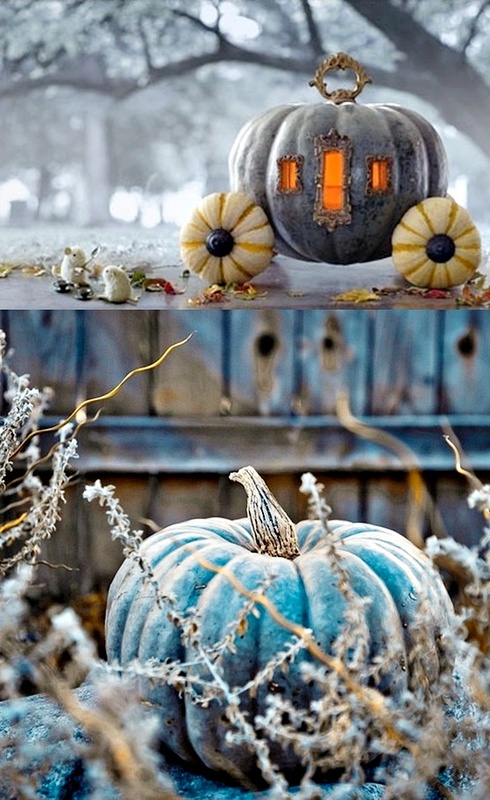 I want one of these pumpkins! nice pictures! love it! and thank you so much for commenting on my blog and following! follow you back now! have a nice weekend! Terrific ideas. Halloween is my favorite holiday for unleashing creativity! Very nice!! HOpe ME celebrates Halloween too ~~ we're missing all the fun. 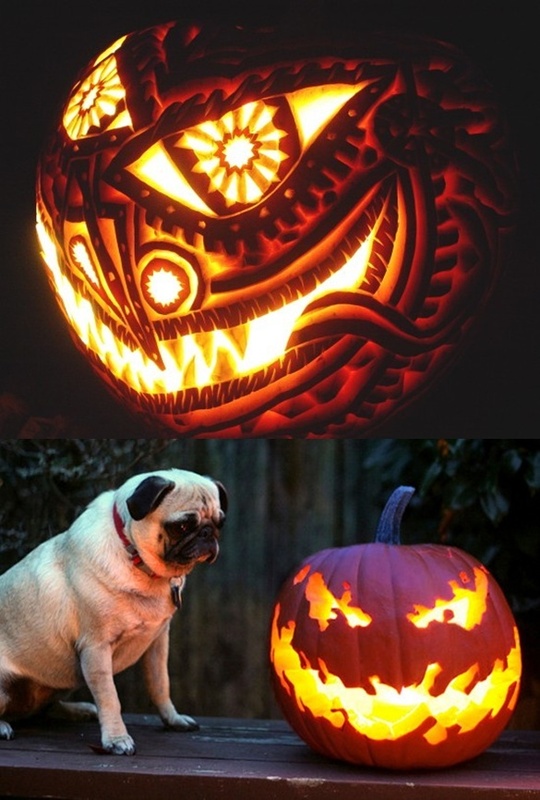 Wow, these pumpkin carvings are sooooo wonderful! Amazing creations. 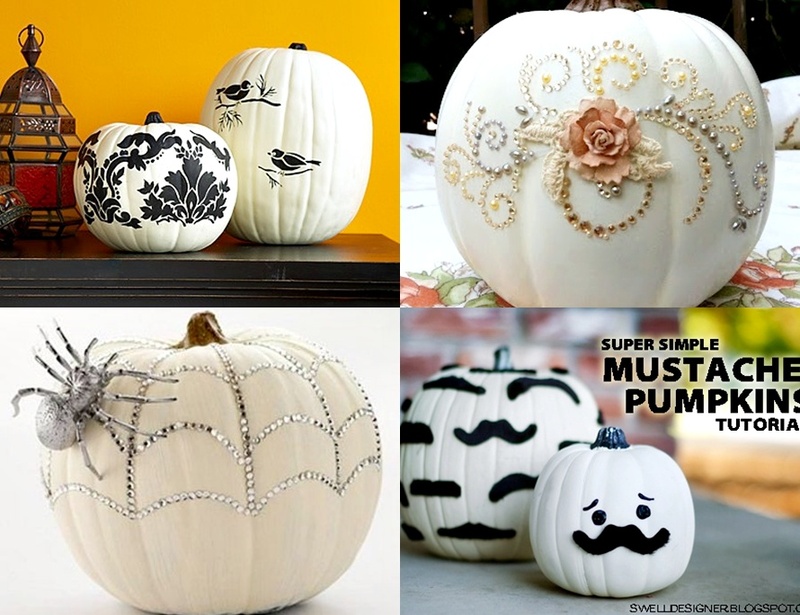 All I can do in a pumpkin is put holes in them and candle inside, nothing as elaborate as these.... Great pumpkin carving ideas you got here! Thanks for sharing. 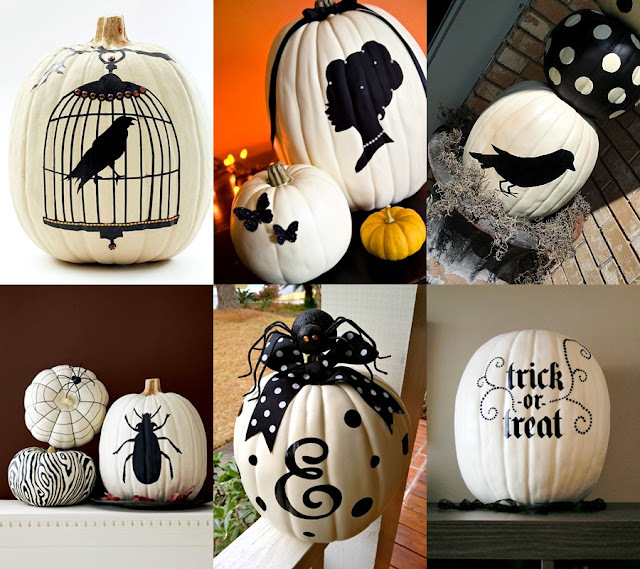 wow, great job compiling pumpkin carving ideas. I love them all, thanks for sharing and more power to your blog. 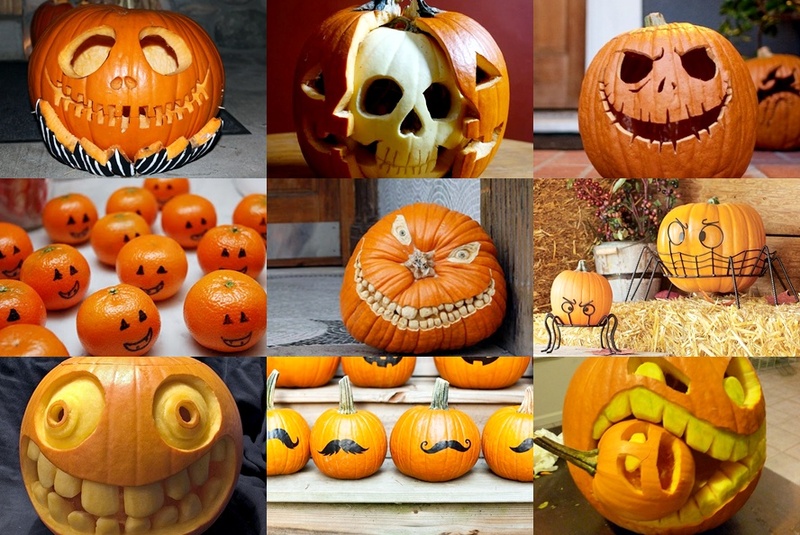 Amazing collection of pumpkin carvings. Their designs are so unbelievable. Great designs and patterns. I pinned some of them in my pinterest board. Aww! 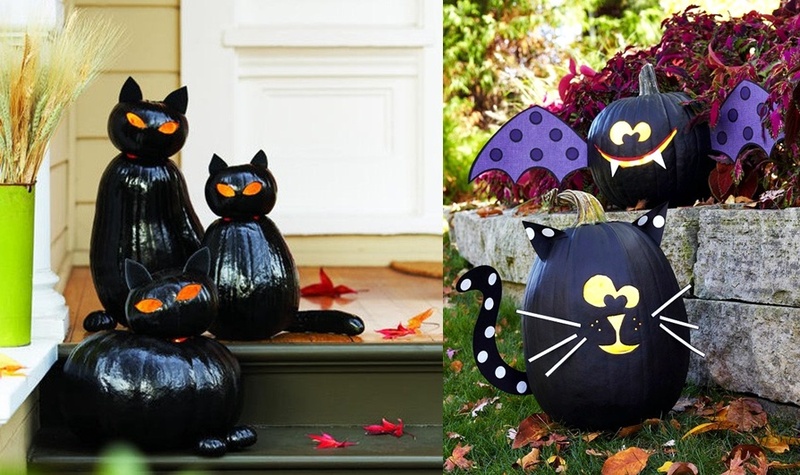 If my family had celebrated Halloween while I was growing up I probably would have carved a cat pumpkin every year myself! Too cute. Happy Halloweeen !!! Here we brings some DIY Creepy Halloween Decoration Ideas for you to celebrate this Halloween event and make it memorable. You can also check History of Halloween as well as Halloween Customs and Traditions on our this blog post. For more details please follow our blogs Halloween Ideas 2018.